The group met as usual on the 3rd Thursday of the month. In addition to our 3 facilitators 13 parents attended (Mums and Dads) including 2 new mums who shared stories of their children. Tears were shed and lots of tea and biscuits consumed. Pictures of our children were hung on the photo tree and candles burned throughout the meeting. We spoke about how it’s hard to sometimes talk to wider family members about how we feel, and that often others just don’t understand – only other bereaved parents truly understand how hard each day can be. We also shared our thoughts about visiting cemeteries, what it means to spend quiet time and reflect and what comfort we feel when we realise that others have also been and left flowers or messages. 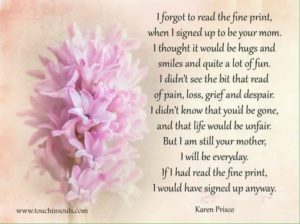 A number of parents are heading for birthdays soon and we talked about how hard it is to celebrate out own birthdays knowing that we are unable to have all the family members with us we would like. Finally we spoke about how some of our other children ( old and young) are coping with the lost of a sibling and how we can help support them grieve even when we are. 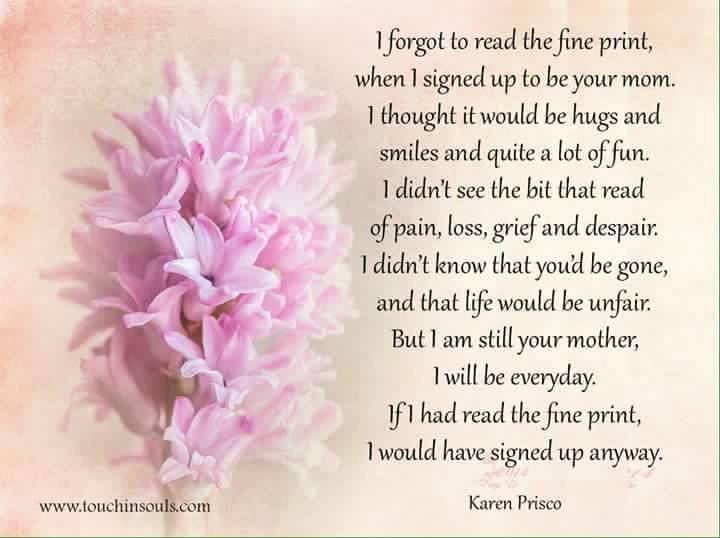 The meeting closed with the following reading – taken from the web site www.touchinsouls.com written by Karen Prisco – although written from a mothers point of view we all agreed it was relevant to us all.